I guess I'm on a health kick or something. Don't worry, I haven't forsaken sugar and butter and all things naughty and delicious. I decided to try this recipe out of pure curiosity. Curiosity killed the cat, but these should theoretically keep me around longer, so why not? I'm glad I did try it because these things are awesome. I was slightly skeptical, but I do love little Japanese pastries filled with sweetened adzuki bean so I figured they couldn't be too awful. I did expect them to taste something like health food though. I mean, they have beets and beans in them for cryin' out loud! I was wrong though - they are nothing like health food. 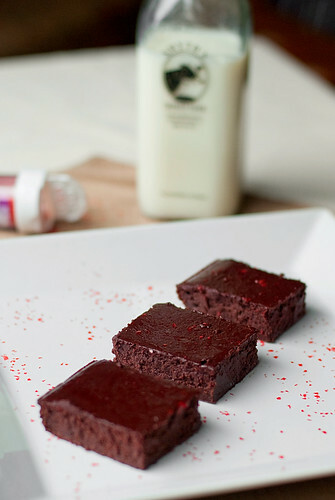 They taste rich and decadent, just like a flourless chocolate cake. In fact, they are good enough that you could bring them to a dinner party as a luscious dessert and laugh silently to yourself as you watch your friends consume something nutritious without their consent! Bahaha! So EVIL! When making these I used a high quality cocoa powder which I'm sure helped with the end product tasting so rich and chocolatey, so don't skimp on that if you can help it. I made it exactly as written to see the results, but next time I will just use a couple of eggs instead of the substitute as that is not something I keep in the fridge or particularly care for. Also, don't over bake them - when you insert a toothpick into the center it should still come out with some batter clinging to it. 1. Preheat oven to 350F. Spray an 8x8inch baking dish with cooking spray. 2. Combine the beets, beans, cocoa powder, egg substitute and flour in the bowl of a food processor. Process until very smooth, about 2 minutes, scraping down the edges of the bowl once halfway through. 3. Add the agave, butter, vanilla, almond extract and food coloring and process until everything is thoroughly combined and smooth, about 1 more minute. 5. Let the squares cool completely in the pan on a wire rack. Once cooled, cover and refrigerate for at least 3 hours. Once they are thoroughly chilled, cut them into squares. Keep refrigerated. This recipe was featured on SteakNPotatoesKindaGurl and Vitamin G on Glamour.com! 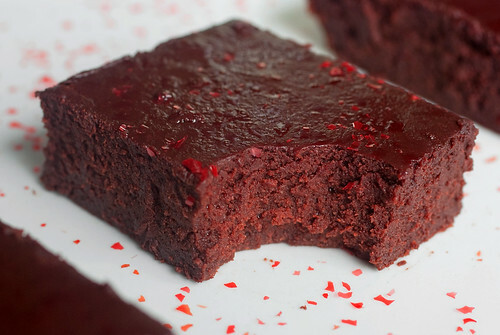 Did you use the natural red food dye in your squares? These look great, I can't wait to make them! I did add some natural food coloring to mine. They have a slightly red tint on their own without it, but it does make them pop a little more! Any suggestions for a gluten free option? I'm new to GF baking so don't know if there's a substitute that would work for the WW pastry flour. They sound delicious though! These do sound DELICIOUS !!! I have made brownies with black beans before & they turned out so moist and rich. Can not WAIT to try these !! Will pass this link along to my friends too ! @Sarah - you might be able to get away without the flour at all, or just substitute it for any other gluten free flour option! I just baked these, and they are delicious! Thanks for the recipe. Glad you liked them! I need to make another batch soon....!